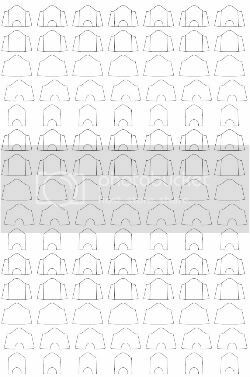 For those interested, some B&Cers asked if I could make a template for the greave plates I use on some of my space marines. 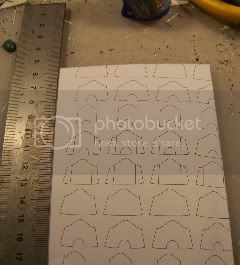 As I hade to make a vectorised image of them anyway for a cnc mill, I thought I might as well export the template to PDF. The middle right one is the measurement I usually use and it should work. I added the other templates so it's easier to make different type. The large one without foothole is the original design and was cut down to fit which yielded the one I use now. Okay, let’s try and make a clear tutorial. 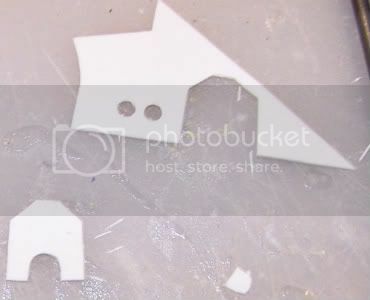 Then, cut out any one of the shapes. 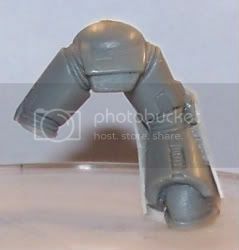 The smaller shape is the one I use in this tutorial, as it should fit (an upright standing) marine immediately. 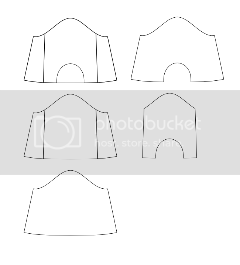 The other shapes are meant to help with the creation of your own greave shapes. 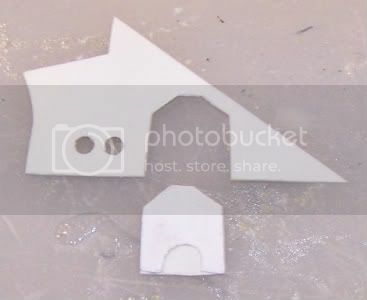 When you have the paper shape, you should dry-fit it on the marine that will get them. 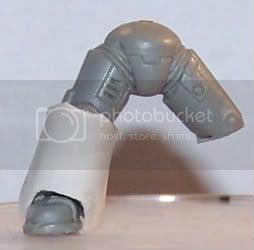 GW space marines are not all of the same dimensions and some modifications will most likely be necessary. 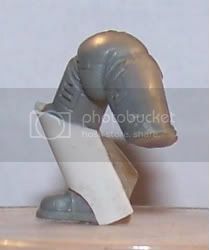 I also created these templates mostly for upright standing marines, so the odd bend marines have at the knee might be in the way. As you can see the paper is a bit large. This is perfect if you like this shape, but you might like something else better. I used a little bit of wood glue (PVA) to stick the paper on the mini. This is easily removed without damaging the model. I then modified the template a bit to make it a bit blockier. As you can see the template is still rough, but this can be changed at any point. Lay it on the plasticard, 0,3mm is best as it’s very flexible and glues well, thinner might work but tears easily and glue sometimes melts through the plastic. Thicker can work (I used to use 0,5mm) but it’s harder to work with. 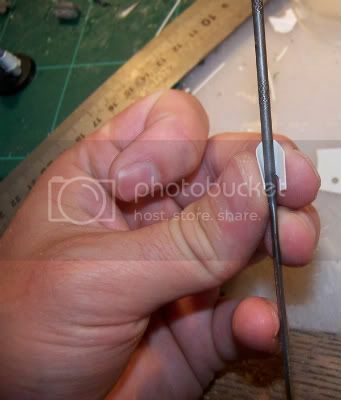 I usually use wood glue (PVA) to glue it to the plastic. 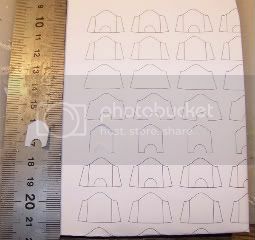 Using the scalpel, cut the template out of the plastic. Finish it up a bit so it’s fully to your liking by shaving the edges or filing what needs filed. Remove the paper from the plastic. 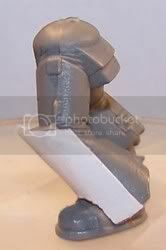 Apply glue to the greave plate, add to model, place correctly and hold while it dries. 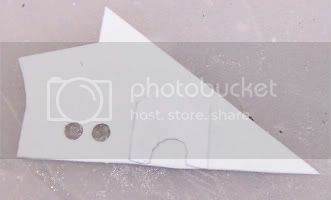 You can use superglue for this step, but thinner superglue gets between the micro-cracks you create when bending the greave plate and might result in tearing. Make sure it fits okay and it’s done. 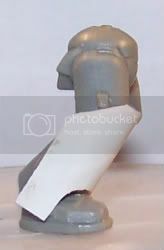 As you can see, this template needed more trimming to fit correctly and the odd bend the marine has in it’s leg is in the way. You could either trim this away after the glue has dried, fill it with greenstuff or just press it tightly together so it fits. Peace means reloading your guns. Printing! Thanks for the work you put into the print sheet. I will be playing with these! I appreciate the time you put into this little mod! Seconded. 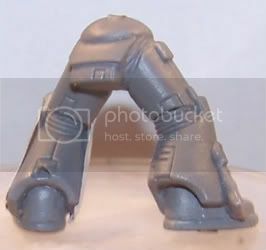 This is going to make my proposed space marine army much easier than trimming all the greaves instead. I don't heat the plastic. with thicker card such as the 0.5mm it might be beneficial, but with the 0,3 it's kind of useless. 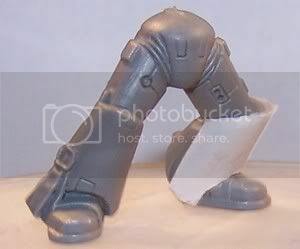 The stuff is almost as bendable as paper. Yes, I tried, an as it's so thin, it's easy to muck it up. I bet you can get some amazing results. The tutorial was indeed requested for that pupose. The people asking for it had trouble finding the correct dimensions for the plates. Turns out quiet well what thickness do you use? It's all in the tut; 0,3mm is what I use but 0,2 and 0,5mm wok fine as well. Wow. Thanks for the templates and step by step. This will make my True-Scale SW project only difficult as opposed to insane.